Bangladesh Bridge Authority Job Circular 2019 has been published. 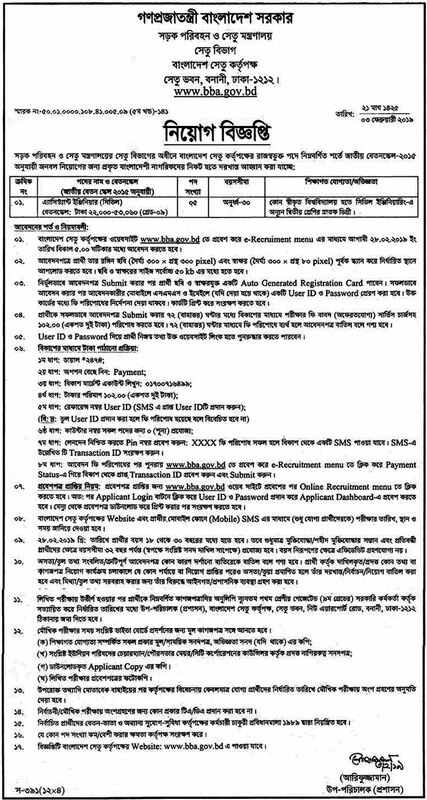 Bangladesh Bridge Authority Jobs great career opportunity some vacant positions own official website. In according to this Job Circular are available on my website. This job circular has been created a huge chance, unemployed people. Bangladesh Roads and Highways department is looking for new manpower for their vacant positions. If you are interested in Roads and Highways jobs in Bangladesh then apply now as soon as. Maximum people want to like to work in the government sector. The last date for applying this Job is 31st January 2019. To know more details please see the original Job Circular. The image file is given below. Bangladesh Bridge Authority Job Circular 2019. Bangladesh Bridge Authority is an autonomous organization under Bridges Division with a total manpower 211. Bridges Division under Ministry of Road Transport & Bridges established in March 2008, has been playing an important role in the transport sector of the country. As per the Rules of Business, implementation & maintenance of bridges & tunnels having the length of 1500 m or over, toll road, flyover, expressway, causeway, ring road etc. have come under the purview of this Division. Only shortlisted candidates will be invited for the interview. Bangladesh Bridge Authority reserves the right to accept or reject any application without assigning any reason whatsoever. Bangladesh Bridge Authority Job Circular 2019.